Popular Crisscross Tunics Today Only! October 10, 2017 by Cheree' Leave a Comment This post may contain affiliate links, which means if you click on a link and purchase something, I may earn a small commission (at no additional cost to you.) See my disclosure policy HERE. Oh my stars, how cute is this??? 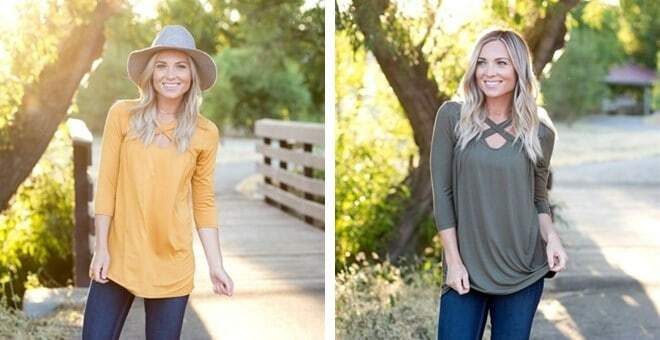 Today ONLY, Jane.com is offering these popular crossed neck tunics for just $18.99. Classy and a little bit sassy! We love the stylish touch the crisscross neckline gives this already gorgeous tunic! Can we also take a minute to appreciate the pretty colors it is offered in?? Love. You will adore how this tunic feels and looks on – snag a few colors so you won't feel bad about wearing it all the time! Hurry to snag one HERE!